Grace’s women’s basketball team picked up its second road win of the week, downing Mt. Vernon Nazarene 76-65 on Saturday. Grace had five players score in double figures, led by 16 points apiece from Vironnica Drake and Kyannah Stull. Kaylie Warble also impressed with a double-double of 13 points and 13 rebounds. The Lady Lancers (12-12, 6-6 Crossroads League) were dangerous with their relentless fullcourt press. The Cougars (11-13, 4-8 CL) committed 19 turnovers, leading to 20 points for Grace off those miscues. Grace, on the other hand, tied its season-best with seven turnovers. In the first quarter, the Cougars led for most of the 10 minutes. Both offenses were quiet, but Grace scored five straight points late to tie the score 11-11. The Lady Lancers’ defense began to shape the game starting in the second quarter. Grace scored 10 points off turnovers in the first five minutes of the period, which helped open up a seven-point lead. Back-to-back scores from Warble and Brooke Sugg propelled Grace to an 11-point cushion, and the Lady Lancers led 36-29 at halftime. MVNU actually outshot Grace in the half, making 50 percent of its shots compared to 43 percent for the Lady Lancers. The Cougars turned the ball over 10 times compared to just once for Grace. In the third quarter, MVNU slowly chipped away at Grace’s lead and eventually trailed by just one at 49-48. Sugg responded with four points over the final minutes to help Grace to a 55-50 advantage entering the final stanza. Grace’s offense was slow to start the fourth quarter with a few turnovers. The Cougars cut Grace’s lead down to three. Kaylie Warble gave Grace’s offense a boost with an and-1, and Drake buried a 3-pointer in the corner to put the Lady Lancers ahead 61-54. After another turnover by the Cougars, Kamryn Hostetler hit a 3-pointer to extend the cushion to 10. With less than five minutes remaining, Drake made an acrobatic steal off Grace’s press. She flipped a pass to Hostetler who finished a layup in traffic for a 68-56 lead. Late in the game, Kyannah Stull scored four straight points to help keep the Cougars from rallying, and Sugg secured the victory with four free throws. Stull’s 16 points came on 5-of-7 shooting, including 2-of-2 from beyond the arc. Drake had 16 points, 3 rebounds, 2 assists and 2 steals. Sugg tallied 15 points, 6 assists and 3 steals, Hostetler scored 12 points, and Lauren Godfrey chipped in four points. Grace shot 42 percent from the floor compared to 48 percent for MVNU, but the Lady Lancers shot a best-high 93 percent (14-of-15) from the foul line. The Lady Lancers return home on Wednesday for a doubleheader with Goshen. The women will tip off at 6 p.m. with the men’s game to follow at the Manahan Orthopaedic Capital Center. Grace’s men’s basketball team suffered another narrow defeat, just missing a chance to upset the No. 6-ranked team in the NAIA. The Lancers had a shot in the final seconds to send the game to overtime but ultimately fell 83-80 at Mt. Vernon Nazarene on Saturday. Grace and MVNU were practically even statistically. Each team had four players score in double figures, and they both made 30 field goals. Logan Godfrey had 20 points, 6 rebounds and 3 assists, and Haden Deaton and Jaret Sons each scored 18. Grace started the contest with four straight points, including buckets by Charlie Warner and Godfrey. But MVNU quickly countered with a 14-1 run over the next four minutes to claim an early advantage. The Cougars (20-4, 8-4 Crossroads League) were efficient offensively throughout the first half, shooting 47 percent with 10 assists on 15 made shots. The Lancers (11-13, 1-11 CL) faced a 40-33 deficit at halftime as a result. Deaton (11 points) and Godfrey (10) accounted for 64 percent of Grace’s offense in the first half. MVNU tried to bury Grace with an early flurry to start the second half. Back-to-back 3-pointers from the Cougars put Grace behind 50-37. But the Lancers refused to wilt. Grace went on an inspiring run over the next five minutes to grab the lead. The Lancers went on a 22-4 run with nearly every player on the court contributing to the scoring. Braxton Linville started the run with a triple, and Sons hit three 3-pointers in the span of a minute. A strong post move from Godfrey gave Grace a 58-56 lead with 12:54 remaining, the team’s first lead since the opening minutes of the game. Warner followed that up with a 3-pointer to expand the Lancers’ lead to five. The Cougars called timeout at that point, however, and quickly scored five straight to tie the game. After a Lancer missed shot, MVNU scored again to regain the lead 63-61. The score teetered back and forth between the teams down the stretch. Deaton buried a 3-pointer with 2:35 remaining, and Godfrey later tied the game 78-78 with 1:42 on the clock. MVNU scored in the post on the next play, and Grace proceeded to turn the ball over. The Lancers got the defensive stop they needed, but Grace was unable to secure the rebound and had to foul to extend the game. After two MVNU free throws, Warner made a deep jump shot to trim MVNU’s lead down to two. The Cougars then missed the front-end of their bonus free throw, handing Grace a chance to tie or win the game in regulation. The Lancers’ option at a 3-pointer was snuffed out, but Godfrey found space in the lane for a potential game-tying shot. Godfrey’s shot was blocked, however, allowing the Cougars to escape for a win in regulation. Godfrey’s 20 points came on 8-of-12 shooting. Deaton had 18 points, 6 rebounds and 4 assists, and Sons tallied 18 points, 7 boards, 2 assists and 2 steals. Warner was the fourth Lancer to score in double figures, producing 14 points and three assists. Linville added 6 points, 4 rebounds and 3 assists. Grace shot 50 percent from the floor, including 56 percent after halftime. Grace also had 10 assists and just two turnovers over the final 20 minutes. The Lancers are back at home on Wednesday. Grace welcomes Goshen for an 8 p.m. clash, the second half of a doubleheader with the women’s teams. LCA capped its final regular season with a big road win. LCA had all 12 players contribute something to the scoresheet, led by 10 points each and a combined 15 steals from Jessi Calizo and Anna Reimink. Calizo added three blocks and Reimink had four blocks and five assists. Tori Calizo had nine points and 14 rebounds, Maddie Paris added four points and five boards, Carly O’Hara had six points and Avery Hobbs added four points, two rebounds and a steal. The Couriers (2-11) had Allison Snyder lead the team with 16 points. LCA closes the regular season 13-9 and will prepare for a Tuesday matchup with host Fremont in the Class 1-A Fremont Sectional. 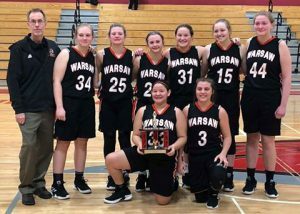 Fourth time was a charm for Warsaw, which had its contest with Goshen postponed three times before getting matters underway in the NLC closer for both clubs Saturday afternoon. After a sluggish three quarters of play, Goshen led 25-24. But a spark in the fourth with Kensie Ryman’s steal and layup put Warsaw up seven at 34-27, and the Tigers were on their way. Kensie Ryman finished with nine points while sister Maddie Ryman led the squad with 16 points. Abby Sanner added five points and seven boards. Brynn Shoup-Hill led Goshen (14-8, 4-3 NLC) with 13 points and seven rebounds. Warsaw’s JV concluded its season 18-4 after a 39-26 win over the RedHawks. Adin Um led a balanced Warsaw attack with nine points. Cora West had eight points and seven steals, and Sydney Lancaster chipped in six points. The Lady Tigers defeated an undefeated Northridge team 27-24 to win the NLC freshman tournament. In the morning game the Lady Tigers beat Concord 32-23 to get to the championship game. Total scoring for the day was Hannah Hatfield with 32 points while Kiersten Parker and Eryn Watmough netted nine points each. Warsaw wraps up its NLC season 5-2 and tied for second with Plymouth. The Tigers end 14-8 overall and will play Elkhart Memorial Tuesday night in the opening round of the Northridge Sectional. Parkur Dalrymple and Jalen Shepherd both scored season highs to pace the Vikings to a non-conference victory over the Couriers. Dalrymple led all scorers with 27 points while Shepherd eclipsed 20 points for the first time this season with 20 on the nose. Dalrymple was 5-11 from three-point range and added 8-9 from the free throw line while chipping in four rebounds, four assists and two steals. Shepherd was 9-12 from the floor and tossed in three boards and a steal for good measure. Tanner Trippiedi had nine points and two steals and Cam Parker finished with six points, six board and three dimes. CJ Mathis led Clinton Christian with 15 points, Tylan Mullet and Seth Shetler each finished with 12 points and Herschel Miller added 11 points. The JV contest went to Valley by a 76-25 count. Valley evens up at 8-8 and will host Three Rivers Conference leaders Wabash Thursday. Elkhart Central put on a furious rally Saturday night, but Warsaw stood tall in overtime to get a road win between intrasectional teams. The Tigers blew a 15-point advantage heading into the fourth quarter, allowing Elkhart to run up a 22-7 bulge in the fourth quarter to send the game into overtime. But Warsaw held the Chargers to just three points in the bonus period to grab the win. Nolan Groninger overcame seven turnovers to score 21 points and pull down six boards to lead Warsaw. Trevor Rumple again provided spark off the bench with 16 points, nailing four from deep. The Tigers struggled taking care of the ball, committing 22 team turnovers to just 12 assists. Elkhart also had trouble handling the ball, giving away possession 25 times. Titus Rodgers led the Blazers with 10 points, but also had 10 turnovers. DuMarrion Williams also had 10 points and Laz Miller had nine points and six boards. The Warsaw JV team (13-2) beat Elkhart Central 56-35. Brock Poe led the Tigers with 19 points, eight rebounds and five assists. Jackson Dawson had 12 points and seven rebounds as well. Drew McCleary added 13 points. Warsaw (11-4) will host Elkhart Memorial Thursday in a huge NLC contest, the Chargers coming into the game 4-1 in the standings staring up at Warsaw’s 5-0 mark. Chuckie Wilcox had the hot hand for the Blue Jays with 24 points in the Hoosier North win. Wilcox was 7-13 from the floor, including three makes from three-point land and added a pair of steals in the solid night. Cooper Hochstedler hit 10 free throws and scored 12 points, Caden Benson was 7-7 from two-point range and added 16 total points, and Payton Cox chipped in 10 points. Triton was 12-17 from the floor inside the arc, but were a frigid 5-22 from deep in its demise. Tye Orsund paced the Trojans with 14 points while Beau Hepler and Ashton Oviedo each came in with 10 points. Hepler added six rebounds and four assists. Triton’s JV squad rolled to a 59-34 win over the Blue Jays. Tyson Yates went 9-11 from the free throw line and finished with 13 points. Hunter McIntyre was 6-6 from the floor for 12 points and Bruce Johnson added 10 points and four rebounds. Kason Sanchez led the Jays with nine points. Triton (5-8, 2-2 HNAC) visits Argos Thursday night. Wawasee shook off a tough loss Friday night at Concord with a solid win Saturday against a potential sectional opponent. Aaron Evans rose up with 19 points and seven boards, shooting 8-10 from the floor. Austin Miller had another big night shooting the ball with 14 points following a 24-point performance against the Minutemen. Ben Hoffert added nine points and four assists for the Warriors, which broke a five-game losing skid. Brayden Bontrager led the hosts with 14 points and five boards, which saw its mini three-game win streak come to an end. Wawasee’s JV won its contest 42-33. Wawasee (4-11) host Northridge Thursday night in NLC play. Wawasee picked up its 10th win of the season Saturday morning on the road. Landon Gause again led the Warriors in scoring with 10 points while Holden Babb came up with 10 points. Wawasee scored just nine total points in the first half, but came out of the break with 14 in the third quarter. Wawasee (10-4) plays again Monday at home against NorthWood. 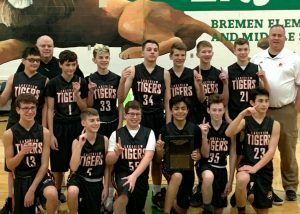 Edgewood capped a perfect season at 17-0 with a championship in the Northeast Lake Middle School Conference tournament in Bremen. Edgewood toppled Wawasee 45-14 in the semi-finals, using Neez Smith’s 12 points and 10 more from Drew Heckaman. Lakeview made the finals by beating Bremen 46-26. Jaxson Gould continued his torrid scoring with 24 more points. Jackson Poe added six points. 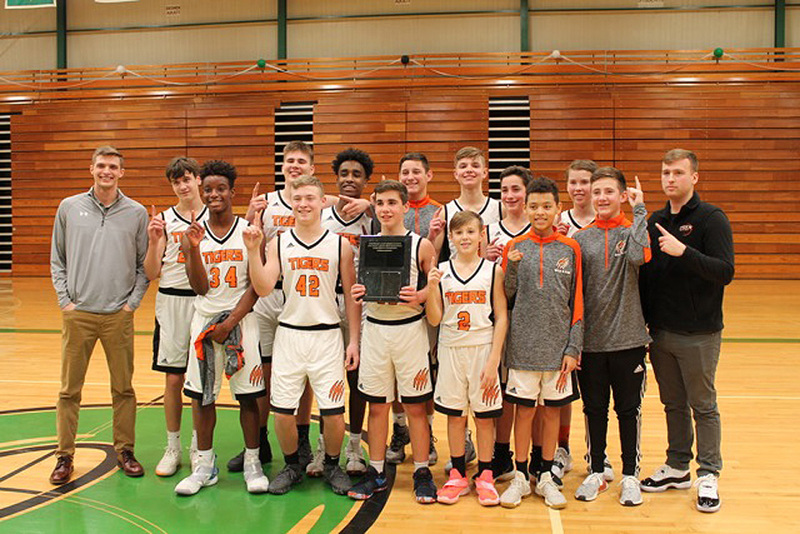 In the finals against crosstown rival Lakeview, Heckaman rang up 18 points in the championship performance leading Edgewood to a 42-29 victory. Russ Winchester added nine points in the win while Gould finished up his fantastic year with 19 points. Will Bergen added six points for Lakeview. Lakeview’s 7th grade team won the NELMSC title. Lakeview won the NELMSC title with a well-contested final against its rivals. In the semis against Milford, Lakeview rolled 35-12. Layton Isbell paced the winners with 12 points. In the final against Edgewood, Quinten Maahs led the victors with 10 points. The Lakeview squad ends the season 18-5 overall. LCA (8-2) used a good shooting performance to fly past Clinton Christian in greater Middlebury. Finley Hobbs was 6-7 from the floor and led LCA with 13 points. The team overall was 21-40 from the floor (53 percent). Maddie Silveus finished with nine points, six steals and four rebounds and Alexis Miller, Addisyn Daley and Cara McCrum all had six points. The LCA boys also enjoyed a win on the road Saturday. Will Hotchkin paced the visitors with nine points while Seth Martin was just behind at eight points. Jamie Wyatt and Ben Jackson combined for 12 points to aid the win. Lakeview’s 22-16 loss to Lincoln in the opening round saw the Tigers bounce back with a 42-17 win over Fremont in game two. Riley Boren and Ryley Burns paced Lakeview in the first game with four points apiece. Lauren Grose notched nine points in the game two win, with Kenzie Atkins right behind with eight points. Lakeview added a title by taking its two games at the Brad Eby Classic hosted by NorthWood Middle School. Lakeview made the final by first beating Plymouth 36-22. Leading the way was Joey Rastrelli with 17 points with Leah Henderson chipping in eight points. Lakeview then beat NorthWood 32-28 in the championship, allowing just four points to the Panthers in the first half. Henderson and Rastrelli combined for 20 of the points in the championship game. NorthWood’s journey had it beat Fremont 49-15 in the first game. Sunny Snyder had 11 points and three rebounds and Karis Bennett piled up 10 points, four rebounds and an assist. In the title game, Daisie Thomas led NorthWood with 11 points, nine rebounds, five steals and a block.